Seriously though…. there wasn’t one person with a baby on board that could lend the crew a diaper to scoop up the mess? 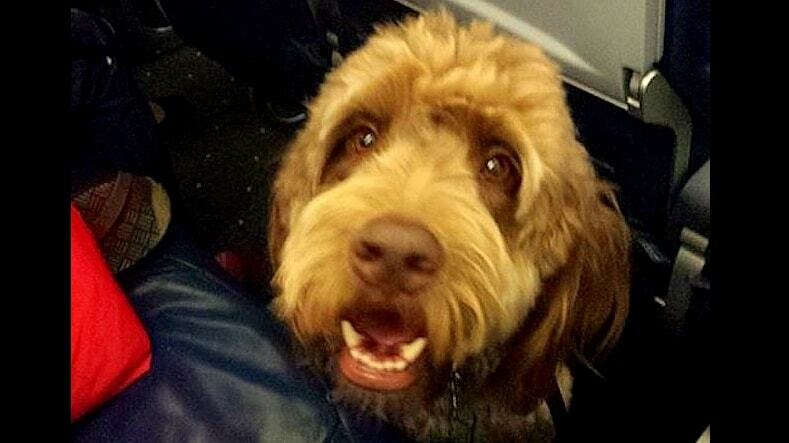 A US Airways flight had to make an emergency landing because a service dog on board kept pooping in the plane’s aisle. People had apparently never dealt with such a terrible situation before, and rather than hold their noses and spray air freshener, the pilot was forced to make an unscheduled landing. The Philly-bound flight had already been delayed two hours in Los Angeles, so passengers were already feeling edgy. About an hour into the flight, some noticed a noxious odor. The unlucky crew cleaned up the mess, but an hour later, the cabin still smelled bad and the dog had to go again. “A couple of people started dry-heaving, a couple of people were throwing up,” McCall said. 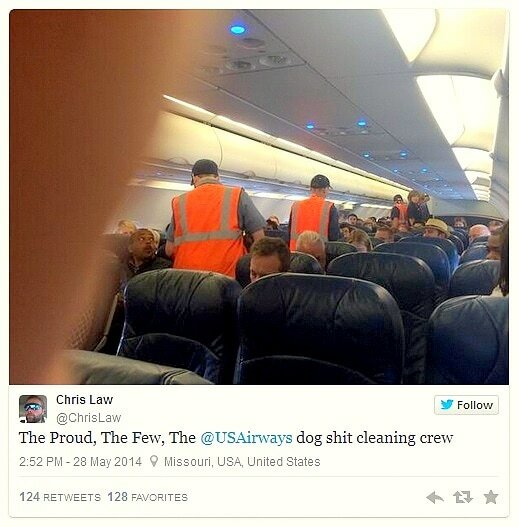 The crew ran out of paper towels, so the pilot diverted to Kansas City to have ground crews clean up and allow the dog a proper bathroom break. The dog’s mortified owner tried to make amends with the passengers. Seriously though…. there wasn’t one person with a baby on board that could lend the crew a diaper to scoop up the mess? No tp in the bathrooms? Why don’t the owners put diapers on the dogs? Expecially large dogs? That wouldn’t have helped with the smell. The only thing that would have done was keep the smell stronger because the poop would have been stuck in the dog’s fur. I’ve used doggy diapers on long trips & carry diaper wipes for the clean caboose. The soiled diaper folds up, keeps the odor to a minimum until it can be properly disposed. It takes a bit of preplanning, but it is doable. On the plane, seems hysteria was contagious! There is no “x” in especially. Thanks for the spelling correction. Hope you slip on dog poop and do a full face plant. Now, back to my relevant question…..
Due to the 2 hour delay, the dog wasn’t able to go after it was taken through security. 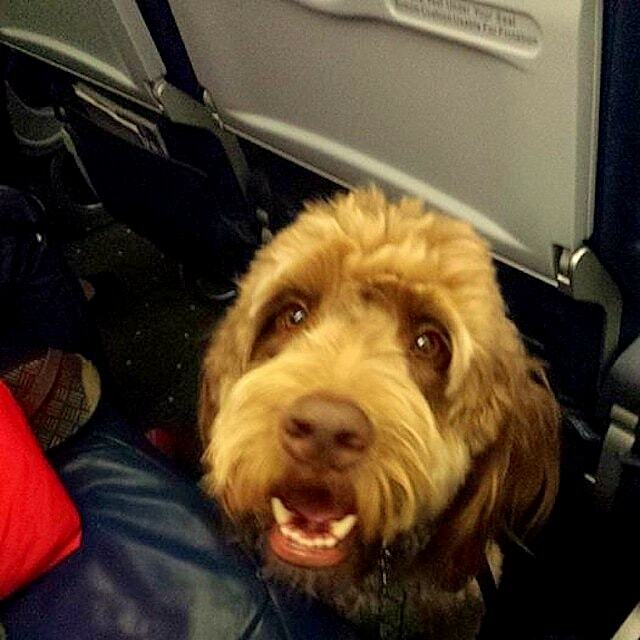 I traveled with a service dog that suffered from anxiety in flight. Unfortunately I was unaware of this until we were in flight for the first time. She did not relieve herself on the plane, but she had monumental gas. Since she was a service animal my stress level went thru the roof. So, think of the disabled person that was not prepared for that long delay. Stop being so selfish. Quit being a baby. This is what’s wrong with our country. The Taliban will win with little girls like you nancing around our great nation. I provide my Service Dog GasX and and anti-acid pre-flight to reduce indigestion and gas related issues while flying. It would be helpful for every airport to have a doggy bathroom INSIDE security to allow the dogs to relieve themselves and reduce stress on both the disabled handlers and the working dogs. I also keep an extra dose of the GasX and anti-acid on hand during the flight in case the need arises for an extra dose. And of course I ran this all by my veterinarian to be sure it was good. Hope that’s helpful info for your next flight with your Service Dog. That’s why I hate dogs….. And dog owners. Soo…hang on, you’re reading articles on a website specifically aimed at dog lovers, why? Also that is very short sighted of you. Do you know enough dog owners to say that you hate them? I know I’m not perfect but I’m not that bad and I own a dog. 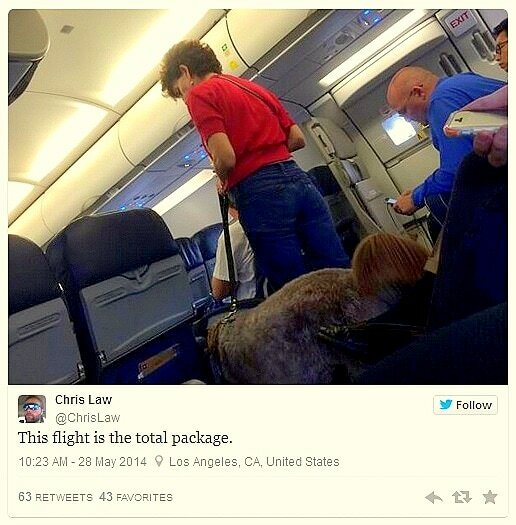 The poor dog was probably nervous being on the flight!